For the second consecutive year, Art Brussels took place in the Tour & Taxis building, a former customs house. 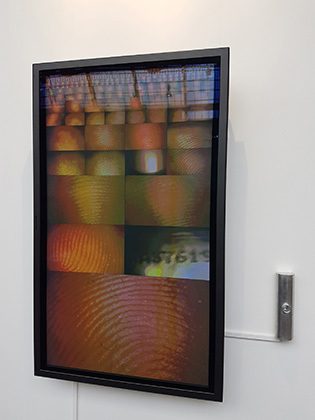 It is precisely here that the Swiss gallery Art Bartschi & Cie shows a work of Rafael Lozano-Hemmer, a Mexican artist from Montreal, which revolves around what continues to distinguish us at the borders, meaning our fingerprints. The room called “Pulse Index” encourages us to scan our fingertip in order to become part of the artwork’s database in constant evolution. This purchasable version of a larger installation pulses at the speed of the beat of the hearts of those who embody it, merging together. This is the rule: when one enters, another leaves and nobody is aware, beyond the differences, of whom one fuses with. This digital device - let us remember that the term digital comes from the Latin “digitalis”, which stands for finger - has a genuine symbolic scope, if not political, in a time of the most extreme intolerances here and there, leading to the reinforcement of highlighting our differences. In the hallways of Art Brussels, there is a repetitive sound that undeniably draws us to the stand of the Mazzoli gallery of Berlin. 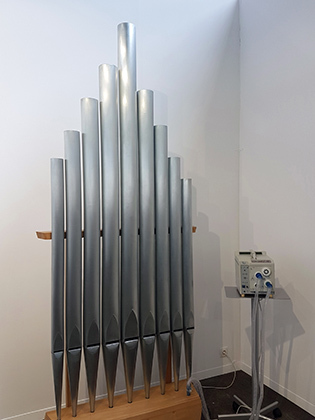 It is the sound of the assisted breathing of an organ that has been connected by the Italian artist Michele Spanghero to a device coming from the hospital environment: an artificial respirator. The breathing of the device literally gives life to the few pipes that make up the organ playing a requiem without beginning or end. Hence the title of this sound installation is “Ad.lib”. That is to say that the music symbolizing the infinite time that precedes the after can, or must be, played "Ad libitum", therefore until absolute satisfaction. But whose satisfaction? The audience's, who would never get tired of what expresses life, even though it is only due to an artifice! A fake life whose rhythm is extremely familiar to us. Unless, in this context, we would rather see - or hear - art being put “under assistance” by a globalized market, which has a dominant position up to the international institutions themselves. It is a piece of news that has inspired the works that Caroline Delieutraz has put together in the solo show that the Parisian gallery 22,48 m2 held in Brussels. The story goes back to the end of 2015 when 119 scorpions from the species “Pandinus Dictator” - also the title of the series - were taken by customs at Roissy airport. 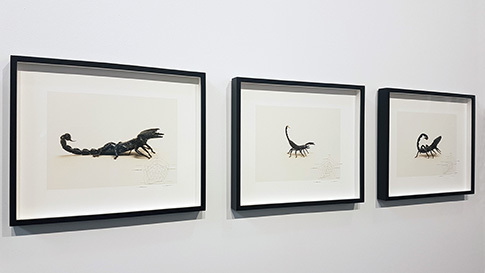 The French artist drew up an inventory of the scorpions with the medium of photography by associating them with skills diagrams. As if to insist on their value, far beyond the art market, for unscrupulous collectors. These arachnids are fragile, for their species is protected, despite the danger of their venom. Furthermore, their extreme resistance to radiation is almost suspect to us. The degrees of ability that give us diagrams associated with them add one more element to the mysterious character of these animals of another time. The scorpions originate from Cameroun, and when they are exhibited they illustrate the decontextualisation that threatens the species. Let us leave Tour & Taxis to go to the Wiels contemporary art center, where the exhibition “The Absent Museum” gathers some works of the series 'Pixel-Collage' of Thomas Hirschhorn. He associates fashion photographs with news footage creating, through pixels abstraction, unusual transitions. 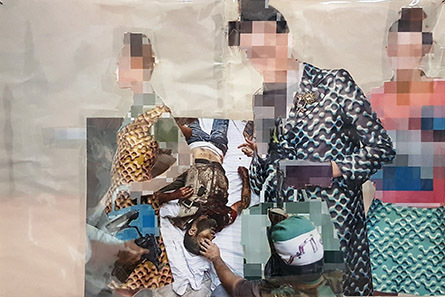 But the fashion photographs symbolizing the idea of relative perfection are the ones that, very largely, are pixelated, whereas the mutilated bodies are not. This work by the Swiss artist leaves no one indifferent. And it is far beyond the horrors that his message makes sense. We may wonder why he shows what is usually concealed from us. Indeed, regardless of the media, there are instances and authorities that decide what can or must be revealed to us. The question is to know who has the right to preserve us from the horrors? Especially when we know that it is, sometimes, at the sight of these sets of unbearable images, that governments or organizations have to finally act under the pressure of public opinion. In our devices, the pixel is to the images what the polygon is to the objects. However, the latter is at the center of what Lawrence Malstaf presents in the exhibition “Where are sounds?” of the contemporary art center Centrale. 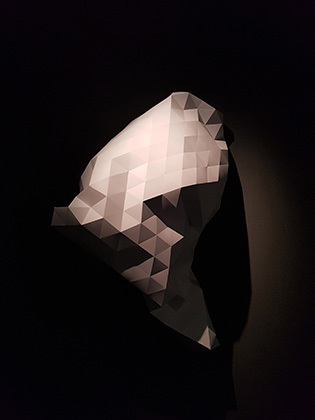 His series of kinetic sculptures entitled “Folding” encourages us to consider the obvious proximity that exists between the traditional practice of folding and the one, more recently, of three-dimensional modeling. But the works of this Flemish artist can move. Besides, the object that we think we recognize despite the restricted number of faces potentially becomes something else. The balance of forces, with this artist trained in industrial design, is an essential question. Here, the mechanisms of the back act on the deformations of the front as moving joints on a tense skin. Between the inert and the living, there are the movements that only mathematics are able to anticipate or make explicit. The same mathematics, science of abstraction, that are common to the calculation of foldings by humans and the computation of objects by machines. In the neighborhood of Molenbeek, Société is an exhibition platform where we can see some conceptual works during Art Brussels. Among these, the reactivation of a work that Jan Dibbets had initially conceived for the exhibition “Art By Telephone” by the Museum of Contemporary Art of Chicago in 1969. Entitled “Ten stops on a straight road” tells us the protocol that needs to be followed, which is: take ten photographs on a straight eight-kilometer road. But the world has changed and we cannot stop along the roads or highways knowing that such images already exist in the database of the Street View photographic apparatus. 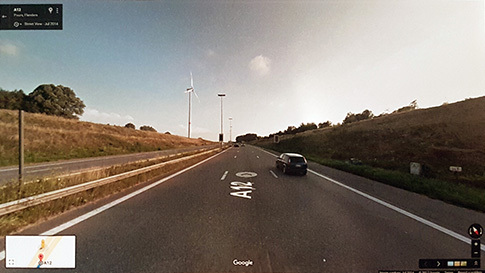 Also, it is with the Dutch artist's agreement that Manuel Abendroth, Grégory Lang and Els Vermang, the exhibition’s curators to the “Modus Operandi”, have extracted the photographs from Street View to make them the artwork. Therefore, the protocol is respected even though the car of Google's apparatus never stopped and the Internet, in this case - which is not an isolated example - has replaced the telephone.remplacé le téléphone. “ Light Standard ”, 2016. Finally, it is in the neighborhood of Saint-Gilles that the art agency White Circle presented the works of an exhibition called “Alpha & Omega, Principium et Finis”, including two artworks by Félicie d'Estienne d'Orves's series “Light Standard”. 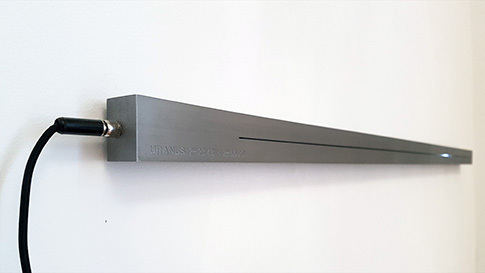 Working with data provided by NASA, this French artist conceived measuring instruments, which look like meter standard bars. Only two out of seven in total, “VENUS: 2.20 AT 15 MIN” and “URANUS: 2:40 AT 3 O'CLOCK”, are exposed in Brussels. But what we see is time, throughout the infinitely slow movement of an electroluminescent light, all along the steel bars. Or more exactly the time that it takes for the light to reach us from these planets that are far, in the scale of our space technologies, and close to that of the Universe. And the extreme speed of the light is seen thanks to the glowing that moves very slowly, reinforcing the idea of a distant proximity. Written by Dominique Moulon for MediaArtDesign.net and translated by Garance Moulon, April 2017.